Happy Halloween everyone! I have a funny story for you today. Mercy Watson, the single minded pig who loves buttered toast, is back . 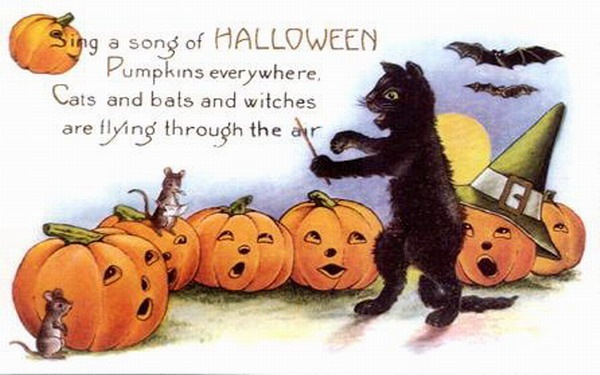 In this adventure, Mercy Watson and her humans get into the spirit of Halloween, with disastrous consequences. One October afternoon, Mr. and Mrs. Watson are sitting together in their living room when Mrs. Watson comes up with an idea. She suggests that this year Mercy, their pet pig, should dress up for Halloween. 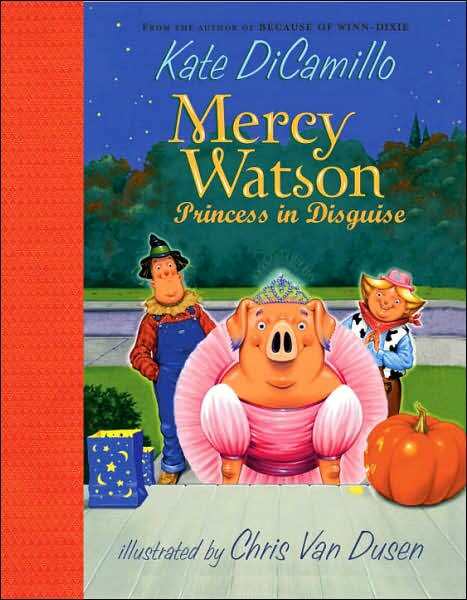 Mr. Watson thinks that this is a grand idea and he is quite agreeable that Mercy should be dressed up a princess. In no time at all, Mrs. Watson has created a large pink froo froo dress for Mercy, and Mr. Watson has managed to find a tiara for her. Unfortunately, Mercy does not feel at all inclined to wear the outfit. At least she isn't until it is explained that she will get "treats" if she wear the dress and the tiara. So, with a sigh, she allows Mrs. Watson to dress her. On Halloween night, the Watsons begin their trick-or-treating by visiting their neighbors, the Lincoln sisters. Baby is happy to see them, but sour Eugenia does not believe in letting pigs go trick-or-treating and she slams the door in Mercy's face. Kind Baby has the Watsons come to the kitchen door and she offers Mercy the treat bowl. All goes well until the Lincoln sisters' cat comes on to the scene. Then everything goes wrong very fast. In this delightful holiday title, Mercy Watson is sure to give readers plenty of laughs. With great patience the "porcine vision" puts up with a great deal just so that she might have her favourite treat in the world - buttered toast. A text full of chuckles and wonderfully expressive illustrations make this a perfect book for young readers. This is the fourth book in the Mercy Watson series. When I was a child, we had a large fluffy and very gentle dog called Balloo. On occasion, I put some of my clothes on her, and Balloo tolerated this treatment with good humor and patience. Once I put a hat on her, and when I looked into her face I recognized the expression I saw there. Balloo was embarrassed! As quickly as possible I took the hat off her head and apologized. I never dressed her up again. In today's picture book you will meet Zorro, a pug whose owner dresses him up and who thus makes her pet feel very embarrassed indeed. Zorro the pug and his friend Mister Bud are ready for the day to begin. They get their person up, they have their biscuits, and then they make it clear that it is time for their morning walk. Zorro and Mister Bud cannot understand what is delaying their person, and then she puts an “outfit” on Zorro. The pug is extremely embarrassed by his superhero outfit, and he doesn’t want to go for his usual morning walk. What if someone sees him? Sure enough, when Eddie and the boys see Zorro, they make fun of the outfit. Even Slim the cat has something to say about the outfit, and it isn’t complimentary either. Mister Bud does his best to cheer up his friend, but Zorro is too depressed. How will he ever live down the humiliation? Being the odd one out is never easy. People stare at you, they make comments, and all in all you feel as if the whole world is saying things about you. In this clever and deliciously amusing picture book, we see how one little dog tries to come to terms with an embarrassing problem, and how the problem seems to solve itself. This is the second book starring Zorro and Mister Bud. Poetry Friday - A review of Oops! Sometimes I get so busy and so involved in my work and chores that I forget to notice the little things that make life amusing. Not taking the time to enjoy things that are funny and silly is a grave mistake to make. Thankfully, I live with goofy people and animals whose actions allow me to get a regular dose of the chuckles. For those of you who need a laugh or two I recommend that you pick up the book I have reviewed below. It is chuckle worthy, and after you have read a few of the poems, you will surely feel lighter and happier. Some of my favorite chapter books are the titles in the Daisy Dawson collection. These books are full of sweetly funny moments, charming characters, and just a little touch of magic. In today's fiction title, Daisy Dawson and her friends find out that sometimes we have to leave the home we love, so that we can come back to it. Some parents have the misconception that their children are going to turn out to be little versions of themselves. Perhaps in the beginning this happens, but after a while our children become their own people, and we have to accept and celebrate their individuality. Today's picture book is about three monsters who set about creating a big monster. They intend for him to be a bigger version of themselves, but they find out that sometimes one cannot anticipate how a creation is going to turn out. Grouch, Grump, and Gloom ‘n’ Doom are three little monsters who live in a suitably dark and dank castle, and who make a point of being as unpleasantly monsterish as possible. The one thing that they have in common is that they cannot agree which of them is “the biggest, baddest monster,” and this causes no end of trouble and countless brawls. Finally, the monsters decide that the solution to their problem is to create a “MONSTER monster. The biggest, baddest monster EVER!” They build their creature, and then with the help of a convenient lightning strike, they bring him to life. The three monsters are thrilled with their creation. Now, at last, they know which of them is “the biggest, baddest monster.” Their monster is going to be a credit to monsterdom, and he is going to leave chaos in his wake. It never occurs to them that their plan might not work out the way they expect it to. Young readers are going to love this clever and unusual story with its heartwarming and surprising ending. They will see how even the best laid plan can backfire, and how, in this case at least, the problem turns out to be an unexpected gift. When I was still quite young, I read about the dodo bird, a flightless bird that was so tame that humans were able to come right up to it. Needless to say, the humans took advantage of the situation, killed the dodos for their meat, and the birds were wiped out. Not long after reading about the bird, I saw a model of a dodo in a museum, and my heart went out to the poor funny looking creature. How sad it was that I would never get the opportunity to see one in the flesh, or even see a photo of one. Ever since that day, I have tried to do what I could to protect threatened animal and plant species so that they don't disappear. In today's poetry title you will get to meet the dodo and several other species that are no longer with us. I am sure the poems will move and inspire you. There are times when all of us are tempted to ignore or avoid our problems rather than face them. No one wants to suffer the pain that comes with confronting problems. In today's fiction title we meet some young people who take this avoidance strategy to a whole new level, and who thus create a situation that has its own set of problems. Not long ago Georges’ father lost his job and Georges and his family had to move out of the house and into an apartment. It was hard for Georges to leave behind his custom bed and the house that was filled with so many good memories, and his father is relieved with Georges starts spending time with a boy called Safer, who lives in the same apartment building. Safer claims to be a spy who is keeping tabs on the mysterious Mr. X who lives in an apartment upstairs. Safer is convinced that Mr. X is up to no good, that perhaps he is murdering people and cutting their bodies into pieces in his bathtub. Safer uses the intercom system in the building to spy on people, especially Mr. X, and Georges is appalled when Safer even takes Mr. X’s laundry out of the washing machine so that he can look through all the pockets in the clothes. As time goes by, Safer’s demands become more and more bizarre, and Georges starts to feel uncomfortable about Safer’s activities. What makes things even worse is that Georges’ school life is miserable. A boy called Dallas is going out of his way to pick on Georges, making fun of his name and everything else that he can think of. Georges feels so very alone in school, and so very alone at home as well. His mother is working extra shifts at the hospital and his father is so busy that he does not realize that Georges is struggling. Then Georges make a discovery about Safer, and his world come crashing down around him. Suddenly what seemed to be real is nothing but an illusion, and Georges has no idea where lies and deceptions end and the truth begins. Trying to adjust to big and unexpected changes can be very hard for a young person, especially if he or she has no support system in place. This remarkable book explores the lives of several children who try to deal with their fears by pretending they don’t exist. Their loves converge and the most unexpected thing happens. Though there is pain in this story, there is also hope and humor. Readers will be amazed to see how Georges, the boy who keeps his head down and tries to ignore his problems, finally finds himself confronting them. Most of us have things or people whom we turn to when we are feeling glum.When I am down in the dumps I tend to seek hugs from my husband and daughter, snuggles from my pets, and I pull out my copies of Wind in the Willows, Pooh, or Pride and Prejudice. These three book titles are my comfort titles, my bookish equivalent of hot chocolate, mac and cheese, or toasted cheese sandwiches. Today's picture book is a perfect title to read when you need a pick-me-up. The story is heartwarming, the characters are charming, and the art is softly gorgeous. Then Moose suggests that they all work together to build a house that they can share, a proper house with windows, doors, and all the other modern conveniences. There is a problem though. Building such a house takes skill, and Moose and his friends are going to need some help. There is only one thing to do in such a situation: Moose calls the Beavers to help. After all, when it comes to building things, the Beavers know a thing or two. In this wonderful picture book, Inga Moore pairs her truly gorgeous illustrations with a story that is brimming with warmth and goodwill. The book is just the thing to read on a not-so-good-day when one is feeling glum and out of sorts. When I was in school, we children spent a lot of time memorizing quotes, facts, figures, and rules. It was tedious, and to be honest most of the time we memorized things for tests and then promptly forgot them. The exception to this rule were the poems. Even now, many years later, I can still remember the Jabberwocky, the Walrus and the Carpenter, some of Robert Frost's poems, Ozymandias, and others. Learning these poems helped me understand them better, and it also showed me how beautiful and powerful language can be. Today's poetry title contains a selection of poems that are perfect for learning by heart. Some people are of the opinion that learning poems by heart is a tedious and dull thing to do. What is the point, they ask. Well, learning a poem by heart helps you to better understand why the poet fashioned the poem the way he or she did. One comes to appreciate how images and ideas are fashioned using words, and how certain sounds, rhythms and rhymes conjure up thoughts and feelings in us when we hear them. Next there is a section of poems featuring animals. How could there not be. Children and animals fit together as perfectly and peanut butter and jelly. There are poems about a cat, a rooster, a dog, a pig, a bat, and even a yak. Some are deliciously funny, while others have a more contemplative feel. This animal-centric collection is followed by poems about “Delicious Dishes,” time, happiness, “Weather and Seasons,” sad feelings, “Strange and Mysterious” things, and “Poems from storybooks.” Finally, there are a few poems that are longer and more challenging to memorize. The author concludes by offering her readers some tips on how to learn poetry by heart. Trying to come to terms with the death of a loved one is never easy. I lost my grandmother when I was sixteen, and I found it very hard to pull myself out of my grief. For young children, coming to terms with such a loss is even harder because it does not seem to make any sense. Today's fiction title by Rosemary Wells beautifully shows how one little mouse comes to terms with a death in the family. It is warming and reassuring, and it explores a difficult topic with great sensitivity and sweetness. Jenny’s beloved grandfather teaches Jenny all kinds of valuable lessons and tells her wonderful stories. Then, out of the blue, Grandfather is gone. Mice from all over Boston attend Grandfather’s funeral, even the Cabot Lodges. Poor Jenny is so grief stricken that she cannot be comforted, much to her parents’ distress. She cannot imagine how she is supposed to go on without her grandfather. Losing someone you love is always painful, but for the young such a loss can be devastating and incomprehensible. In this beautifully written and illustrated story, we come to appreciate how special Jenny’s grandfather is, and we see how the little mouse struggles to come to terms with her grief. For many people, the idea of being a writer is very attractive. They see themselves sitting in front of an old-fashioned type writer, banging away on the keys at great speed, the words flowing from their imagination with ease. In reality writing is hard work. It can be boring, frustrating, and it is very rarely an easy process. Stories and characters refuse to appear on command, and then after they do condescend to arrive on the scene, they refuse to cooperate. Today's picture book is about a little dog, Rocket, who writes his first story, and I plan on keeping this book on hand so that I can turn to it when I get frustrated with my own writing. Rocket the dog loves to read. His friend the little yellow bird taught him this valuable skill, and now Rocket eagerly reads books of all kinds. Like many people who love to read, Rocket loves words, and encouraged by the little yellow bird, he goes off to look for new ones when he can. He brings his words back and shares them with his teacher, who helps Rocket to write the words down on small pieces of paper making sure that they are spelled correctly. Then the two friends place the pieces of paper on their word tree. It isn’t long before the word tree is covered with scraps of paper. What should Rocket do with them all? Rocket gets a marvelous idea. He decides that he is going to write a story using the words that he has collected. Rocket gets very excited about the project, and he eagerly tells everyone about it. Then he encounters a problem, a very serious problem. Rocket has no idea what to write. Writing a story for the first time, or even for the hundredth time, can be very challenging. The idea of writing a story is wonderful, and then one is faced with a blank page and an empty mind. Where do story ideas come from? In this delightful book, Tad Hills brings back Rocket, the little dog who learned how to read. We see how Rocket figures out what to write about, and are charmed by the surprising gift that he gets when his first writing project is complete. With loveable characters, sweet minimal illustrations, and a meaningful story, this is a book that will appeal to writers of all ages. When I was still quite young, a friend gave me a book of poems that I must confess I struggled with. The poems, written by a woman called Emily Dickinson, were not what I was used to. They did not rhyme and flow easily off the tongue, and they had strange punctuation. It was only many years later, when I was a teen, that I learned about Emily's life and came to appreciate her poetry. The poems in today's poetry book tell the story of Emily Dickinson's extraordinary life, and I highly recommend it for readers who enjoy poetry and who are drawn to stories about remarkable people. Most of us, at some point, want to win something, or do something that earns us other people's admiration. We want to show the world how good we are at dancing, singing, playing a sport, or winning a contest. Unfortunately, all too often, our efforts backfire. In today's picture book we meet two children who discover that winning is overrated. Other things matter much more. Today the State Fair is open, and Bink and Gollie decide to go to the event. Bink quickly decides that she wants to try hitting a rubber duck with a ball at the Wack-a-Duck booth so that she can win the “world’s largest doughnut.” Unfortunately, Bink has very little skill when it comes to throwing baseballs at rubber ducks, and she ends up hitting the Wack-a-Duck man. In fact, she hits the poor fellow with each of her three baseball throws. After the Wack-a-Duck fiasco, the friends move on, and Gollie sees that there is going to be an amateur talent show. Gollie would love to be in a talent show, and she is sure that she can do her talent on a stage in front of an audience. The problem is that saying you can perform, and being about to actually do it, are two very different things. Poor Gollie discovers just how paralyzing stage fright can be. In this delightful second book featuring Bink and Gollie, the two friends go to the State Fair, and things don’t go quite as anticipated. The good news is that there is one thing the friends can count on, even when they cannot hit a rubber duck or when they get stage fright. With amusing illustrations and three chapters, this title is full of clever touches of humor and we are reminded that there are more important things in life than winning prizes or being in the spotlight. When I was a school girl, my art teachers were very insistent that we children should paint and draw in a certain way. Grass had to be green, houses had to be square, and the sea had to be blue. I got into trouble once for insisting the the sea sometimes looked green or grey. Thankfully, art teachers these days are more open to the idea that young artists should be encouraged to try new things, and to explore new ways of looking at things. Peter Reynolds is an author and illustrator who has created several books about the artistic process. I consider his books The Dot and Ish to be inspirational, and today I have a review of his newest book. Marisol loves to draw and paint. She also loves to share her drawings and paintings with others, and uses her art to convey ideas that she cares about. Being an artist “through and through,” Marisol is thrilled when her teacher announces that they are going to paint a mural that will hang in the library. Eagerly the children get to work on a large piece of paper. Marisol volunteers to “paint the sky,” but then she encounters a problem; there is no blue paint. The little girl cannot imagine how she is going to paint the sky if she doesn’t have any blue paint. It is a very troubling problem. Being an artist not only requires that you have a love for creating art, but it is also important that you dare to think outside of the box. Of course you could paint, draw or sculpt like everyone else, but what would it be like if you tried to do something new, something different? In this splendid book, Peter H. Reynolds once again explores the creative process. This time he challenges his readers to see things in a new way, to experiment with their craft to create a work of art that is uniquely theirs.